Sunday, Dec. 12 p.m. – Women’s Basketball vs. North Florida (TigerCast)Youth Basketball Day: All youth basketball players (12 and under) will receive free admission by wearing their jersey. Men’s Basketball (@ClemsonMBB)Record: 5-1The Tigers advanced to the championship game of the Charleston Classic, defeating Temple and Davidson before falling to UMass in the final. Junior forward K.J. McDaniels averaged 18.7 points per game and was named to the all-tournament team. Fellow captain Rod Hall averaged 13 points per game to lead the Tigers this week. Clemson is 5-1 on the season and next plays at home on Friday, Nov. 29 against Coastal Carolina at 7 p.m.
Women’s Basketball (@ClemsonWBB)Record: 2-3The women’s basketball team lost to No. 14 South Carolina at home in a midweek game, but rebounded to knock off USF in Tampa on Sunday. Charmaine Tay led a shorthanded roster with 21 points, 12 rebounds, 4 assists, and 3 steals in the win over the Bulls, who went to the 2nd round of the NCAA Tournament a season ago. 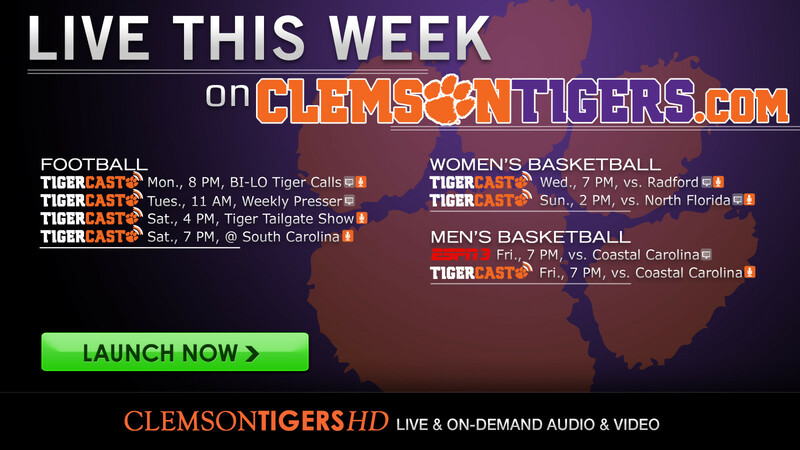 The Tigers host Radford on Wednesday at 7 p.m. and North Florida on Sunday at 2 p.m. Diving (@ClemsonDiving)The women’s diving team competed at the Georgia Tech Invitational and Pittsburgh Invitational this weekend. Overall, five Tigers advanced to the finals in the one-meter and three-meter while five of six Tiger divers finished in top 10 in the platform event. Chelsea Uranaka qualified for NCAA Zones in the three-meter event with a score of 291.30 to finish fifth. Juliana Melchionda and Emily Howard tied for the highest finish by a Tiger on the weekend, coming in third in both three-meter and one-meter. Several Tigers also set career highs on the weekend as they competed in their first invitational of the season. Clemson will return to action on December 15 when it travels to Greensboro, N.C. take on UNC Wilmington in its final meet of the calendar year. Football (@ClemsonFB)Record: 10-1, 7-1 ACCClemson defeated The Citadel 52-6 Saturday to give the Tigers a third-consecutive season of at least 10 wins. 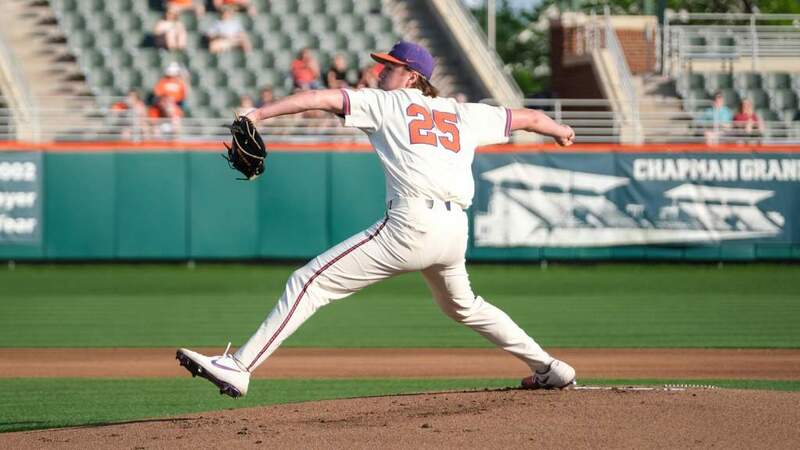 It gave the program 31 wins over the last three years, the most in any three-year period in Clemson history. Tajh Boyd made his final home game memorable with five touchdown passes, all in the first half. It marked the sixth time in his career he had tied the Clemson record for touchdown passes in a game with five. 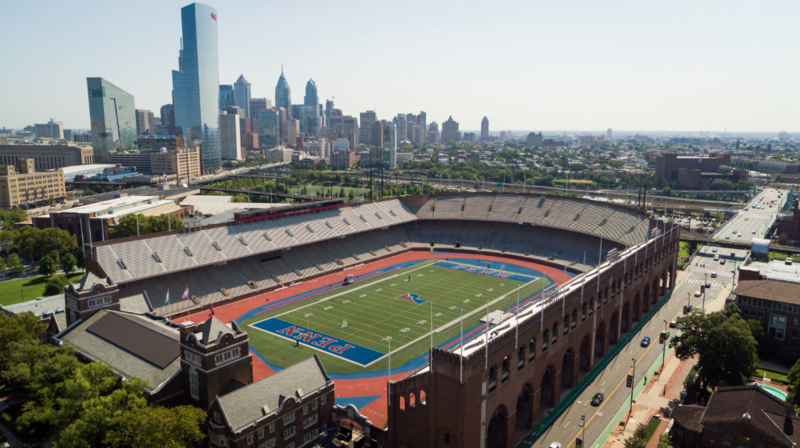 Earlier in the week Boyd was named a finalist for the Johnny Unitas Award. Defensively, Quandon Christian led the way with two tackles for loss and a 22-yard fumble return for a score. Playing in his final home game, it was Christian’s first career touchdown. Chandler Catanzaro had nine points and became the second leading scorer in ACC history with 395 points. Sammy Watkins became Clemson’s career receiving yardage leader with 3071. Clemson ends its regular season at South Carolina this Saturday. 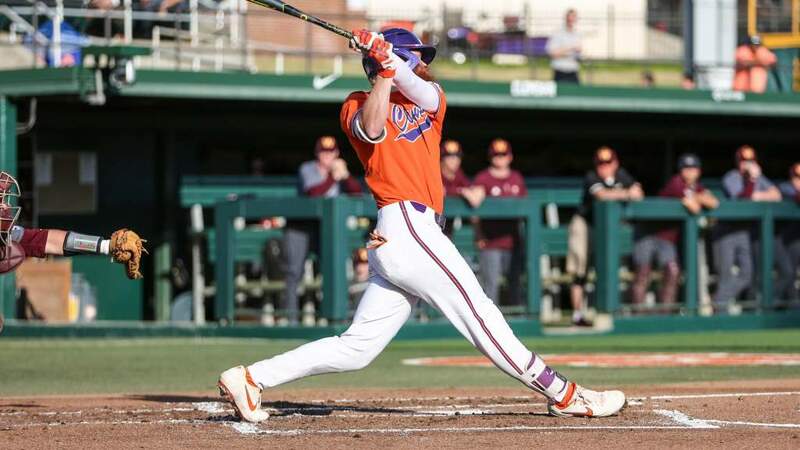 Both Clemson and South Carolina are ranked in the top 10 of both polls and it will mark the first time both teams have been ranked in the top 10 entering the game. Men’s Soccer (@ClemsonMensSoc)Final Record: 11-7-3, 5-4-2 ACCThe men’s soccer team’s outstanding 2013 season came to a heartbreaking end Thursday at Elon, as the Tigers fell in penalty kicks to the homestanding Phoenix. Tied at 1-1 through overtime, Elon claimed a 4-1 victory in PKs. The Tigers finished the season with an 11-7-3 record overall, and the 11 victories were the most for the Tigers since the 2006 season. It also marked the first time the Tigers participated in the NCAA Tournament since 2006. Thomas McNamara finished the campaign as the Tigers’ leading scorer with seven goals and eight assists. Volleyball (@ClemsonVB)Record: 15-14, 9-9 ACCThe volleyball team downed Syracuse, 3-1, and Boston College, 3-0, on Friday and Saturday to move above .500 and even up their ACC record. Prior to Saturday’s match, Clemson honored seniors Hannah Brenner and Mo Simmons. The Tigers close the regular season this week at nationally ranked Florida State on Wednesday and at Miami on Friday.